Say goodbye to crumpled up business cards. Our mocha-brown card holder is a stylish, functional gift for your business savvy groomsmen or fathers. 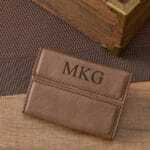 Free Personalization: We’ll personalize with up to three initials for no additional cost! You’ll earn the respect of your colleagues when you’re toting this handy brown business card holder. The design features best of both worlds with a durable construction but a soft feel on the inside. 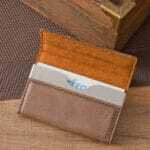 The interior chrome pocket protects your business cards and ensures they don’t get crumpled and bent up. Last but not least, the magnetic closure seals the case tight so it doesn’t accidentally open while you’re on the move. Network in style, friends! Measures 3 3/4" x 2 1/2" x 1/2".